Lentils are a fantastic source of protein, iron, and fiber. 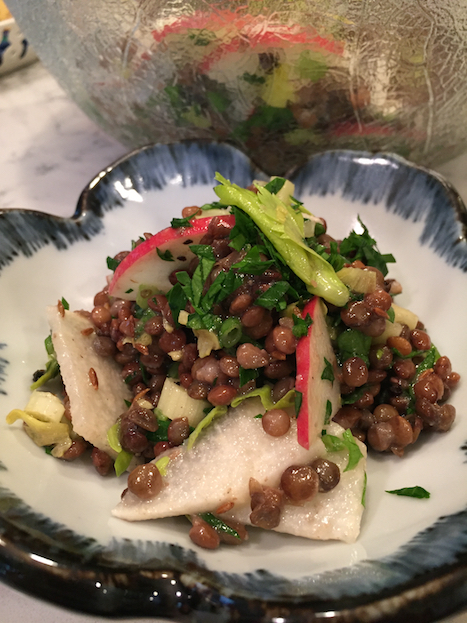 I love making lentils salads because they’re easy, convenient, and filling. I love using the precooked lentils from Trader Joe’s, it’s not that cooking lentils is hard, but I love the convenience of having a package of lentils ready when I need a quick, easy meal. 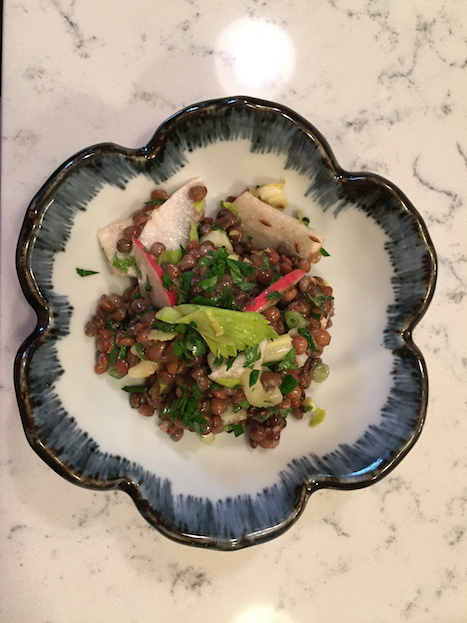 It can also be a challenge to find French Green lentils, or the de puy lentils. Red lentils don’t hold their shape the way green or brown lentils will, so make sure you use the right kind. I made this for the family when Sister and her fiancé were in town. Everyone loved it. The apple and jicama add a little sweet crunch, the dressing is just a touch sweet and then has the smokey flavor from the cumin seeds. If you don’t have cumin seeds you can add ground cumin. Also feel free to alter the vegetables. Don’t have jicama? Try radish or turnip or celeriac. I don’t usually like celery, but I loved it in this salad. This came together so quickly and was such a great refreshing salad, I’ll definitely be making it again and again. Toast the cumin seeds in a dry pan for a few minutes over medium-high heat until fragrant. In a small bowl, whisk all the dressing ingredients together. In a large bowl, combine the salad ingredients. Pour half of the dressing on the salad and toss well. Let sit for at least 15 minutes to allow flavors to meld. Taste and add more dressing as desired.